Here is this week’s Glance of Awesomeness. Creatives – check out these projects and get crackalackin’! 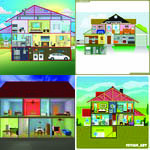 The Breakdown: When I was little, I never had a dollhouse. I would always go over to my friend’s house and wonder why her dolls had a place to sit while eating food that didn’t exist and perfectly proportioned beds to sleep in while mine ended up on the floor. I’m not bitter though. I just wish I had some illustration skills so I could participate in this project and design the functional yet appealing 2 story house for buyer DebPonder to use on a company website and brochure. Maybe someone can contribute my dream house to this project? Just make sure the fridge is stocked with cupcakes! The Breakdown: The idea of an “American Barber Club” evokes a very classic, quaint Americana image in my mind. 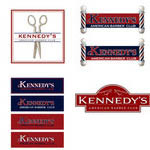 Kennedy’s needs a logo design for their upscale barbershop – a business that’s not so common anymore. If you need any inspiration, check out these barbershop quartet videos or perhaps rent the movie Barbershop featuring rapper Ice Cube to get in the wholesome, upscale gentlemen-catering, logo makin’ mood. The Breakdown: Back to back bonafide, American-styled projects? Either the spirit of Independence Day is still going strong into August, or the Olympic pride is getting to people. I’m probably wrong on both accounts, but hey – a girl can dream! 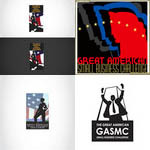 The Association of Small Business Development Centers is launching a new program, and they need our amazing creatives to craft up a patriotic, “big” logo design for their Great American Small Business Challenge. They will be featuring the winning creative on all literature dealing with their award ceremony, so it’s a good chance for some extra promotion! The Breakdown: So, this new service where meeting planners can find hotels to host their events is launching, and they’re looking to crowdSPRING’s creatives to work their magic and whip up a functional yet appealing web design. The wireframes are included in the details as well. No entries as of yet?! Don’t make me design a page and put it up on there. I skipped my first “Introduction to XHTML + Design” class to listen to Elvis Costello’s This Year’s Model on some really great speakers. It wouldn’t be pretty. There you have it for this week, folks. Tune in next week for more Glances of Awesomeness, and feel free to send me any leads!